C7S6CD15 An album so good they released it twice. Or maybe an album that was expected to do so well that when it didn’t they repackaged it, shuffled some tracks about, added a couple and removed a couple and released it again. Alas the same reaction from the general public. I can remember buying this album in bargain bins and giving it to people as I thought it was that good! A duo made up of David Steele and Jonte Short, now I wouldn’t expect you to know Short other than to say she has an amazing voice I know nothing more, but David Steele is another matter. Originally a member of The Beat, who had huge UK success with Mirror in the Bathroom amongst others, he then went onto global success with Fine Young Cannibals. Steel always manages to take a backseat role in the bands and I suspect he can still wander round unnoticed today. Even on the original artwork his image is blurred. Originally released in 2004 there is a heavy influence on this record from Portishead and the trip-hop sounds coming out of Bristol at this time, Beth Gibbon even co-writes one song, but this shouldn’t detract from the work of Steele and Short who deliver 11 tracks of nu-soul of the highest quality. Steele is credited with beats on this album and even gets a help out from RZA from the Wu-Tang Clan on When You Get Out Of Jail. Short has a great voice soul voice along the lines of Shara Nelson on the first Massive Attack album. The stand out tracks are the aforementioned When I Get Out Of Jail and Things Change but this is a classy album filled with great songs that still sound fresh today. I have a DVD of Nu-soul performances from Later with Jools Holland which has Fried performing When I get Out....it’s a fantastic performance full of life and stunning vocals. 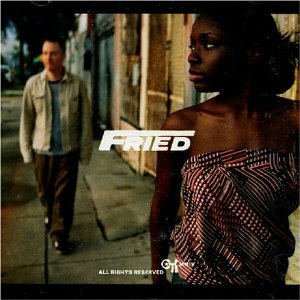 I have no idea why Fried didn’t make it, they seemed to have the backing of the record company, the reviews were good and they had the TV appearances, maybe it was the name Fried? What I would say is this album is worth tracking down it’s a little gem of an album.